Forest Brothers gets closer to publication. One of the real eye-openers to this whole journey was just how many changes were needed. It’s not being too sloppy, but I know the story, I know the words. I can only edit in short bursts before my mind takes over and runs some videotape of a movie of the event. Estonia comes alive for me! We are at the last hurdle and whilst the e-book has been delayed to January, the book launch has been given a date! The book launch is scheduled for Thursday March 14th at 6.30pm at the Aberystwyth Arts Centre bookshop. There may yet be an opportunity to do something in England, but if anyone wants me to come and do a presentation, drop me a line! Following a meeting with the Kay, the editor of Circaidy Gregory Press, I can say we are hurtling along at a pace in getting the e-book ready for Christmas. I am on my final edit. the one with the fine toothcomb and the realisation: no matter how many reads you do, you are so close to your own work that things still fall out at these late hours! I have been in touch with the manager of a city library, who was possibly looking for someone to showcase their work on World Book Day. 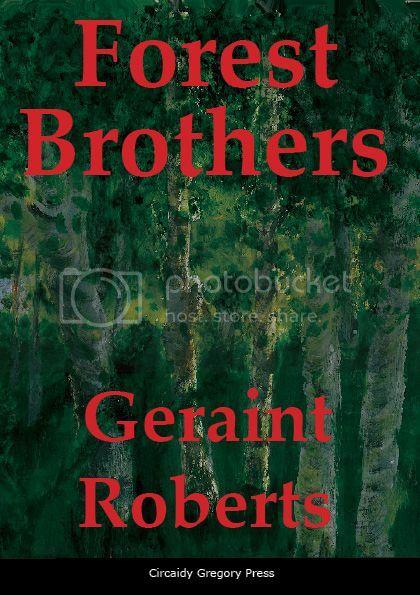 In the hope that this may come off, we are looking to steer the Forest Brothers paperback for release at this time – March 2013. So, the clock has been brought forward and is ticking away quite happily! Strangely enough, I still enjoy reading the work and sometimes pause to play a scene in my head. Then I remember I have to pay particular attention to my prose – in particular the ‘Estonian’ dialogue. It’s back to the grindstone then! Susan Moss (author of ‘Bother in Burmeon’) has given me some excellent tips on Marketing. I know need to knock on the door of the local college and see if someone wants to take on a youtube film ‘trailer’ clip, as a project! Grassroutes promotes public knowledge of Leicestershire’s diverse literary cultures. The project surveys high-quality transcultural writing by Leicestershire-based writers from 1980 to the present. It fosters local, national and international appreciation – as well as critical recognition – for this writing. Grassroutes supports the efforts of independent publishers and literature development agencies to inspire public engagement with the diverse writing cultures of multi-racial Britain. And yes, I do qualify. In the 1980’s – I was a Leicester fox! More recently, I have been active in the wonderful Leicester Writers Club for a lot of this century. The Welsh novel is still being worked on. I have heard nothing about publishing, bar the organisers sending me the judge’s critique. In it, Catrin Collier wrote ‘You certainly have talent and must persevere with your writing’ and also ‘Your work is far too good to fall at the first hurdle’ in her Judge’s summation. It goes on to say the work has been forwarded to a publisher for consideration. I must admit in the awards ceremony, she did say ‘guaranteed e-publication’, which would be nice. I think I should not count my chickens yet, but keep working on the script – just in case. One of my good friends is going to read through it for me. This is a very handy second opinion and can change the direction of a novel at times. As proven with the sterling work done by Steve Hughes and Helena Castro in Forest Brothers, so many moons ago. Last leg of the final edit of the story and there is a quiet delight at how far I have progressed with it. The mission now is to complete the latest edit and watch out for the many things you assume are there – punctuation marks are so easily missed over. Also, in Estonian speech, I have elected to omit the use of the words ‘a’ and ‘the’, to reflect the different structure of the language. Trying to get my brain to recognise this and not add them is quite tricky at times! After this, I need to read it again from start to finish to ensure it is flowing, there are no continuity breaks and that the characters personalities are showing and not schizophrenic! More soon! Possibly another interview! It’s been a busy week! After a long period of inactivity on the Forest Brothers project, I received back the start of the final edit for the manuscript. It’s now looking nice! A bit more detail following my latest trip to Estonia and the Metsavennad part of the story feels much better to me now. The cover is completed, so we are still on for an e-book release by Christmas and a paperback by Easter, via Circaidy Gregory Press under the very able editing of Kay Green. Thanks Kay, for keeping me on track and treating me like a human!! In the meantime, I won a few prizes at the Aber Valley Arts Festival. Third prize in the short story competition with ‘Senghenydd’. It follows the thoughts of one of the rescue team as they search through the coal mine following the blast in 1913 that killed 439 people. The event took place a mile away from the festival and the organisers asked if they could use the work in the memorial service last Monday and for next year’s centenary. I was more than happy to say yes, it was written in memoriam and it is so much in the right place. I have also offered to dramatise it in a short play, which is my work cut out after Forest Brothers and the news below. Which is, that I also won a prize in the Welsh novel competition, which is publication as an e-novel with a noted Welsh small-press publisher. The novel is called ‘The Promise’ and is based in the Aberystwyth area in the early 1900s. It follows the fortunes of a young man, running away from his lead mining home to try and forge a new life. He finds out what happens when life forces you to go back on a promise?. It’s a bit of a rights of passage, romance with the background of the railway construction at the time, without any trainspotters or general nerdy folk! It is actually book 4 of 5 of a family saga set in the lead mining part of Ceredigion. I will have to start another thread for news on this one. The thought of working on two novels at the same time is daunting and yet very very appetising! Watch this space. Q) What is the book about? Q) Where is it set? A) It is set in war-torn Estonia in 1944. The German Army is in retreat and the Red army is advancing to fill the void. A) It is the name given to those who escaped to the forest to avoid capture by either side. Some of them were escaping being forced to join a foreign army. Some were avoiding deportation to places like Siberia. Some wanted to fight to retain their independence. Many groups formed in various parts of the country, with various successes. The term originated from the revolution in Russia in 1905. Q) So, only men allowed? A) No, but the name seems to stick as Forest Brothers. Women were deported also. A) There were acts of rebellion reported – 773 between 1944 and 1947, but many i think just wanted to hide and escape. To be honest, these people were on their own. Nobody supplied them with means to fight or communicate, so it was not an effective network of cells in terms of a resistance movement. But then resistance doesn’t have to be violent. Q) How long did they last? A) It was estimated anything up to 15,000 were active up to 1953, although the KGB were successful in infiltrating many cells leading to arrests and deportations. Following an amnesty most left the forest, but some remained. The last Metsavend was found in 1978, August Sabbe drowned himself to avoid capture by the KGB. Q) Why choose this historical setting? A) My wife and daughter are Estonian and I quickly became interested in their history. I find many similarities in psyche between Estonia and Wales even if they have led very different lives. My main character, Huw, is Welsh, rediscovering a land he once knew. A) At the end of the first world war, Estonia declared its independence from Russia. By 1919, Russia had regrouped and began to look to reclaim land it had lost. Also, a German army was still in Latvia and South Estonia, where its commander was looking to set up a new Reich. The UK elected to send a squadron of Navy ships to Estonia and Latvia to assist the fledgling republics. A) To watch their backs. Estonia and its people earned their own independence, but the Royal Navy kept the Soviet Navy away. Q) So why does this man come back? A) In 1944 British intelligence send Huw to go to ground and feed back information to London. In 1919, he had jumped ship to stay with a woman in Estonia, only to be captured many years later and returned to prison in the UK. His soul is seeking closure. Q) So there is a love interest? A) Yes, Maarja, a strong-willed Estonian girl. From my experience, there isn’t any other type! Q) Any other major characters? A) Yes. There are 2 Forest Brothers. Märt was the baker in Huw’s Estonian village. He went to Finland to fight and returned to the forest. He is hiding a secret that affects everyone. Juhan is a happy-go-lucky young man who seems to fall on his feet, even in such desperate times. There is also a Russian officer, Oleg. He is chasing Huw, but there is more going on there than just duty. Q) So, how much is true? A) I have researched the historical background for the story, individual actions however are fiction. I have tried not to use real characters in direct dialogue. Where characters needed to be traceable eg officers of a Navy ship, they have not been named and are not based on real personalities. The fictional characters supplant the real ones. All the characters are fictional and any resemblance with real people either past or present is purely coincidental. Q) What does the novel give you the chance to do? A) It gives me the chance to bring to life a period and a history that is little known in the UK. There is limited knowledge of what our Navy did and there is a lot of ignorance about what Estonia went through in its turbulent first republic. In 1944, Soviet Russia was an ally, Germany was the enemy. All the Baltic states got swallowed up in the black hole the conflict created and the West stood by and watched. Over here, we seem to be ignorant of anything that happened in Eastern Europe outside of larger countries. It would be nice to change that a tiny bit. Also, it is the story of a man’s chance to redeem himself – that’s worth writing about! Q) When do you expect it to be released? A) Circaidy Gregory press and myself are looking to Christmas for the e-book and next year for the paperback. My lovely editor-to-be passed me back the manuscript of Forest Brothers last week, corrected, amended and with suggestions. I spent a hard week reworking it and spent some time correcting the piece, taking the opportunity to correct some Estonian spellings and a few character name tweaks. One of the main issues has been working with characters whose mother tongue does not use the words ‘the’ and ‘a’. I have omitted them from dialogue to add to the Baltic flavour of it all. However, as I have spent my whole life using the words, it is so hard to train the brain to get rid of them! It is all part of a journey that I am still enjoying, but I need to start thinking of marketing soon! That will be interesting. Haven’t done much in the past, but I do have many people around me who have. I’ll be buying a few beers in the near future!! Forest Brothers still on track for end November as an e-book and April possibly as a paperback. Yay!